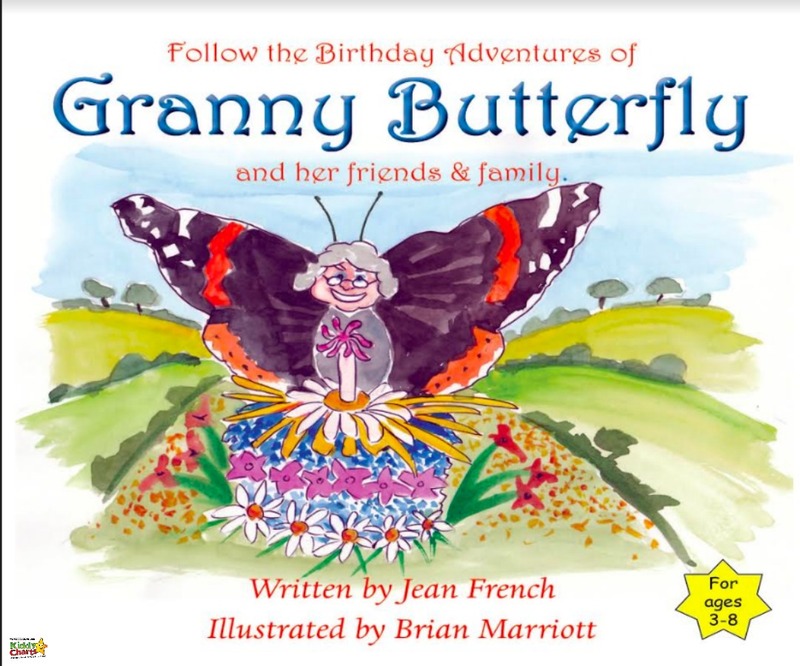 Each of the books introduce children to a marvellously colourful and whimsical cast of butterfly characters; including Granny Butterfly, but also Bertrum, Bluebell, and Boris. All the characters take part in some amazing adventures, but they also help the children reading the books, learn all about the amazing world of butterflies too! We have four lovely colouring sheets for you from the books which include all of your favourite characters from the stories. 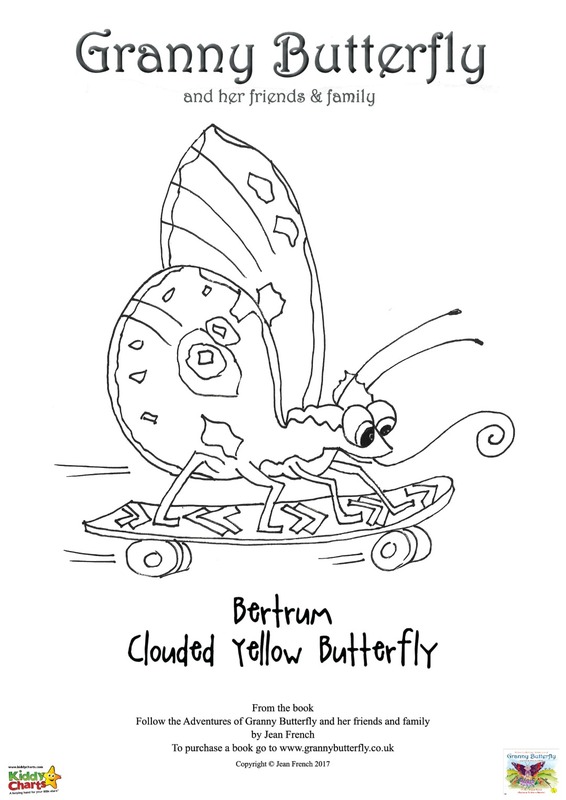 The first picture is an illustration of Bertrum, the Clouded Yellow Butterfly, and Boris, the Purple Emperor Butterfly. Perhaps the kids can follow the standard colours for these, or come up with their own wonderful, and imaginative creations instead? Next we have Bertram all on his own – what would you like to do with this one? 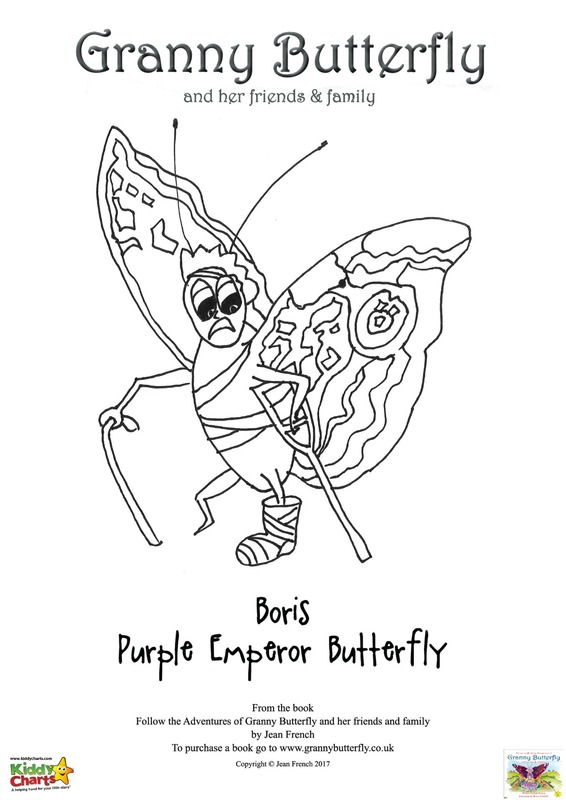 To make sure that Boris doesn’t get left out, we had to include him within the illustrations too, didn’t we?!? 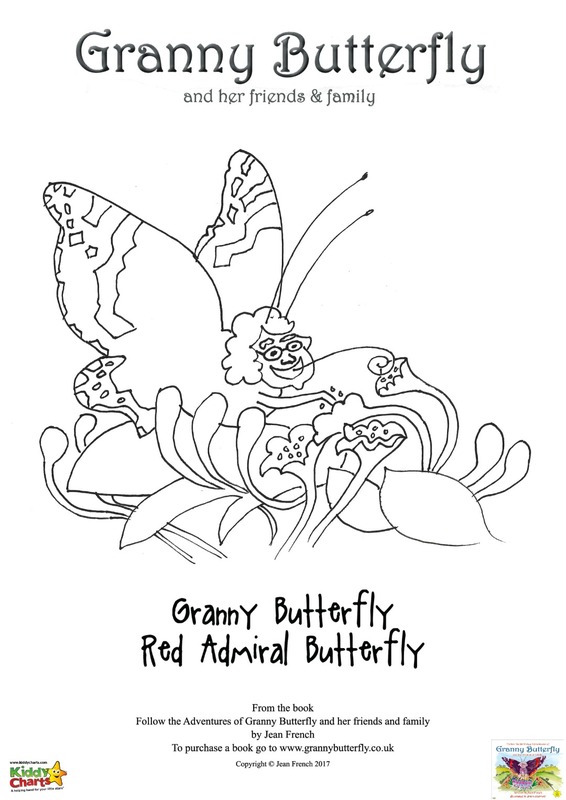 And we couldn’t do these colouring sheets without the Red Admiral, and Granny Butterfly herself, included, now could we? 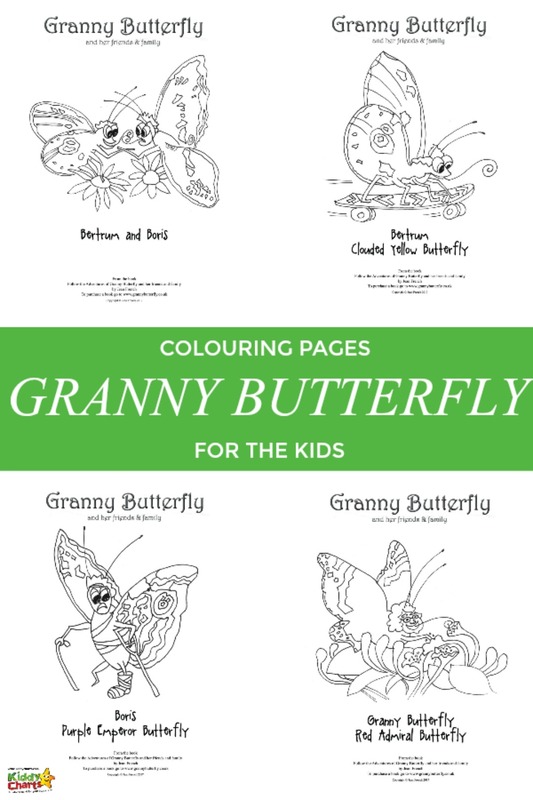 We do have a lot of wonderful colouring sheets on this site, including some more from books for the children. We love to help capture imagination, by enabling both activities and colouring from some of your childrens favourite books. Why not check these articles out on the site? There are loads of printables on the site for you and the kids to explore, so why not take a look; or even better sign up to our newsletter so you never miss out when we release a new one. We share great printables, parenting advice, reviews and giveaways on the site. Thanks so much for popping along to see us, and free free to take a look at our Pinterest as well, where we share other ideas from the internet around books too. Why not check out some of these great butterfly and book activities as well? Raising butterflies in pre-school from pre-K pages. Butterflies are such beautiful creatures, and inspirational for little children; this series is perfect for encouraging them to learn, and explore the world of bugs! Why not get them out in the garden, and taking some pictures of some of the butterflies that you see there when you have read it. There are some wonderful ones that visit the gardens in the UK; particularly if you have a Buddleia in your garden. It is, after all, also know as the Butterfly Bush! 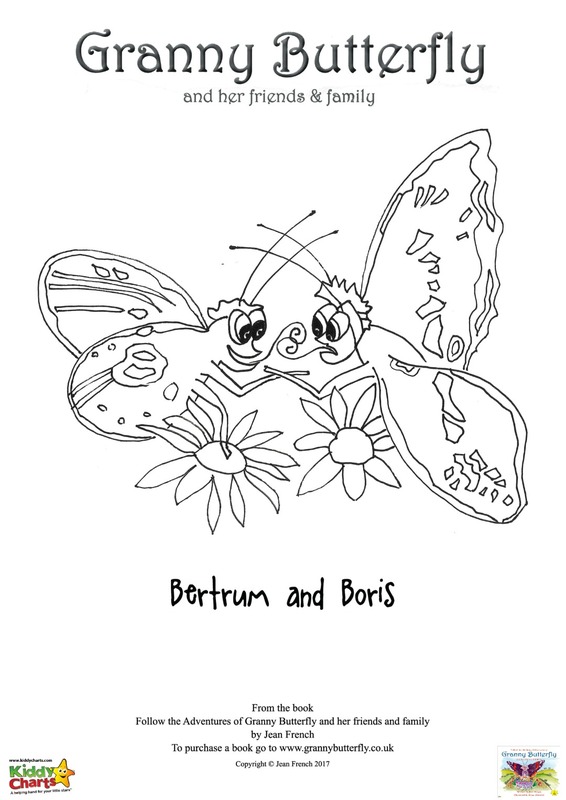 We hope you and your children enjoy these colouring pages, and thanks so much for stopping by. See you next time! Not sure what happened there – all is up and running now!